TBILISI, Georgia (CNS) — At a papal Mass focused on two female saints, the longing for Christian unity and the painful reality of Christian division were strong undertones. A few thousand people — including many expatriates living and working in Georgia — attended the morning Mass, which was celebrated in a Tbilisi soccer stadium. The vast majority of Georgians are members of the Orthodox Church. Catholics, including Armenians, Chaldeans and members of the Latin-rite church, account for only about 2 percent of the population. Vatican officials and people involved in Catholic-Orthodox relations had hoped that Georgian Orthodox Ilia II would send an official delegation to the Mass despite rules preventing the church’s clergy from attending a non-Orthodox liturgy. 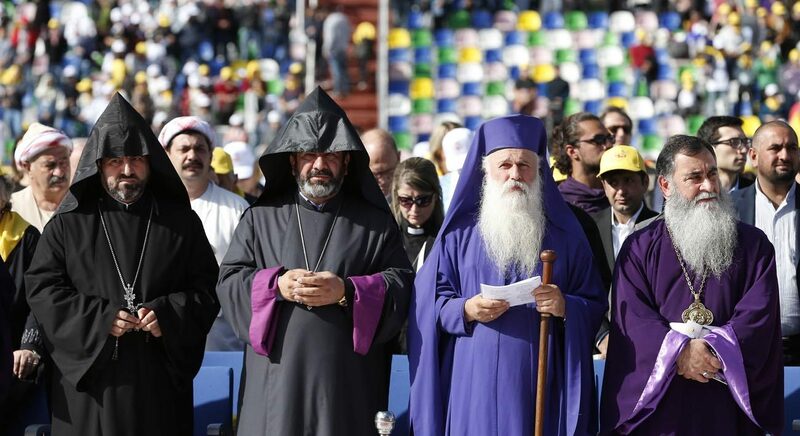 In the end, however, no Georgian Orthodox bishops were present. “We accept their decision,” said Greg Burke, the Vatican spokesman, who also noted that Georgian President Giorgi Margvelashvili, a member of the Orthodox Church, was at the liturgy, as were several Armenian Orthodox bishops. Members of the crowd, though, represented a wide variety of different Christian denominations, as did the choir, which melded singers from the choirs of the Catholic parishes and the Armenian Orthodox, Baptist, Lutheran and Pentecostal churches. The experience of loving, faithful mothers and grandmothers, the pope said, helps believers understand the scriptural description of God. “As a mother takes upon herself the burdens and weariness of her children, so too does God take upon himself our sins and troubles,” he said. “Do I know how to welcome others as guests and console those whom I see tired and disillusioned?” he asked. Catholics cannot allow their parishes or the church to become a “closed ecclesial micro-environment,” the pope said, but must have the courage to reach out to others with humility and respect. Being a child of God means living simply, relying on God and delighting in the surprises God has in store, he said.